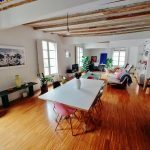 Located on the 2nd floor of a beautiful finca regia building without elevator in eixample esquerra, next to parc de joan miro and close to plaza espanya. The apartment has two bedrooms, one large exterior master bedroom with balcony and one interior double bedroom, which can be used as a guest bedroom or office, and one complete bathroom with bath-tub. There is a bright good sized living room with fully equipped American kitchen and a gallery/terrace area with direct sun, perfect to relax or read a book. The apartment has charming features, such as the high celings with volta catalana and exposed white brick walls. It has been decorated with lots of attention to detail with an eclectic mix of furniture giving this lovely apartment a cosy feel. 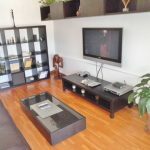 It will make a great home for single or couple looking for bright and tranquil apartment in the centre of Barcelona.